Summary: The MLA code first appeared in 2006 and is applied to two batches of low-sided bogie box wagons used by three different operators. An initial batch of 140 yellow wagons was ordered by GB Railfreight for use on their Metronet contract, some being diverted to Network Rail. EWS followed this with 105 similar wagons but in a red livery. All are used for infrastructure duties. History: In 2005, GB Railfreight was awarded an �80 million contract to supply trains for use on infrastructure renewal work on the London Underground . Metronet was one of two consortia formed in 2003 to take over the LUL infrastructure, and they had responsibility for the 'sub-surface' lines (ie the lines built to full-size loading gauge). Maintenance of the underground had previously been done using LT/LUL's own rolling stock. However, all the sub-surface lines had connections to main-line railways, while the amount of stabling space on the underground is limited. To service the 10-year contract, GB Railfreight ordered 9 class 66 diesel locomotives and a total of 172 wagons. This total was initially planned to include 140 bogie box wagons. 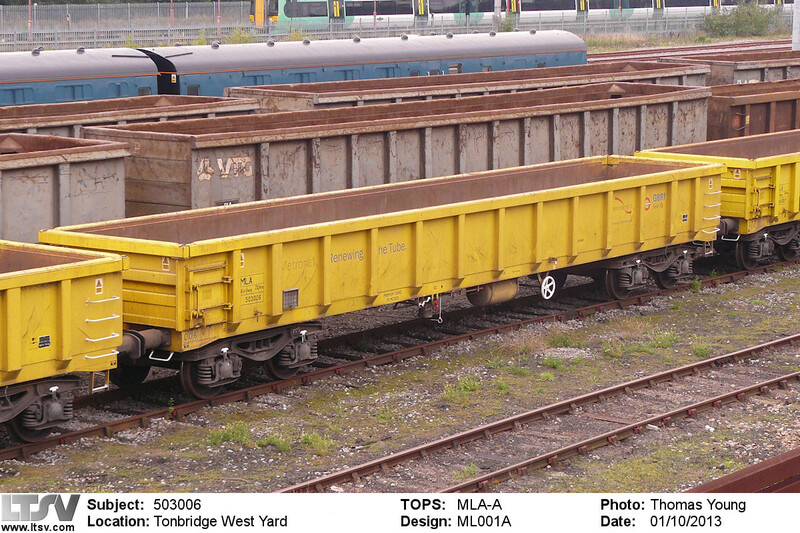 However, some side-tipping ballast wagons were also required and a deal was reached with Network Rail to exchange 50 of the new-build box wagons for 25 nearly-new MRA side-tippers. The new wagons were expected to be built by Trinity Rail in Romania, and coded JNA . The TOPS code for the new wagons was soon changed to MLA, with a fishkind-ish name of 'Falcons' and a new pool code 1559 was created. . The MLAs were actually built by Greenbrier Europe at their Wagonyswidnica works in Poland, with deliveries commencing in mid-2006. Dimensionally similar to the earlier Network Rail JNAs, the MLAs were somewhat different in design, and featured full-length solebars. They also carried a noticeably brighter shade of yellow, and had small doors (for cleaning purposes rather than for unloading) at the left-hand end of each side, and access ladders at the right-hand end. The logos of GB Railfreight, First, London Underground and Metronet were carried, along with the slogan 'Metronet. Renewing the Tube'. Prior to use, five wagons were taken to the Nene Valley Railway for staff training during June 2006 . The GB Railfreight batch was numbered in the railway-owned series as 503001 to 503090 with TOPS code MLA-A and design code ML001A. MLA 503006, seen at Tonbridge West Yard in October 2013, is in largely original condition. The Metronet and First brandings have been removed but are still visible. Delivery of the 50 MLAs for Network Rail (503091 to 503140) followed in June/July 2006. These carried the same bright yellow livery, but without the various logos. Instead, a Network Rail logo was applied on a white patch near the centre of the sides . Another difference was that the access door was omitted, resulting in a new design code of ML002A. 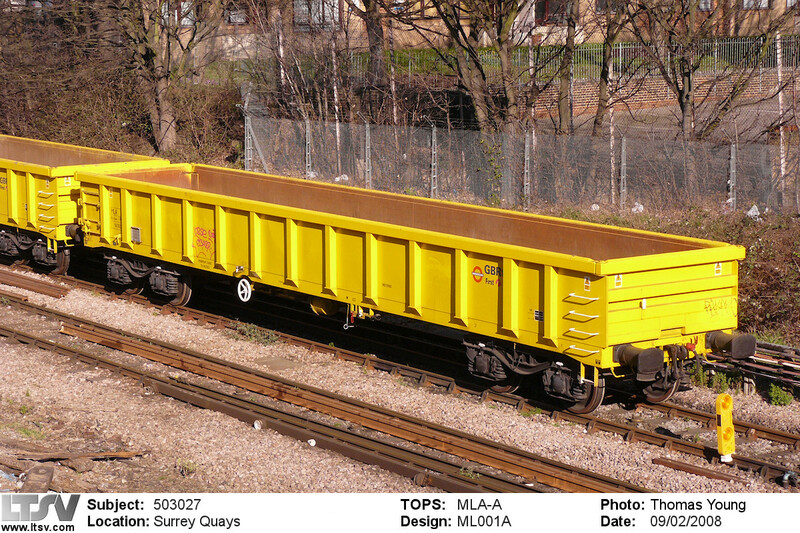 The Network Rail MLAs were used on various infrastructure workings, often mixed-in with the similar JNA wagons. Network Rail MLA 503112 was photographed at Eastleigh in August 2013. The Network Rail logo and the absence of the access door can be seen, while the shade of yellow (albeit somewhat faded) can be compared to that on the JNA coupled behind. Note also the number repeaters on the left-hand headstocks. Despite being for use in London, the GB Railfreight wagons were based at Wellingborough, making the journey down at night or for weekend possessions. They were also sometimes stabled at Ferme Park yard. It is not clear if the wagons were operated through the underground sections of the network, but connections were available at the outer ends of each line. At least 10 MLAs were used on the East London line, being transported there by lorry. It was noted that these wagons had had the Metronet logos and slogans removed. Most of the other MLAs were later similarly treated, following the dissolution of Metronet in 2009, while the First logos were removed after that group sold GB Railfreight in 2010. MLA 503027 was one of 10 used on the East London line renewal, being photographed at Surrey Quays on 9th February 2008. The Metronet logo and slogan had been removed, but again the traces of them are just visible. A further batch of MLA wagons was ordered in late 2007, this time by EWS. 105 wagons were built, again by Greenbrier Europe in Poland, and to almost exactly the same body design at the Network Rail MLAs. However, they were mounted on Axiom Rail Axle-Motion 3 bogies, and the wagons were painted in EWS red with yellow top capping. They were intended for use on infrastructure services for Network Rail . Numbered 503500 to 503604, the wagons were delivered via the channel tunnel. The first arrived in February 2008 , with delivery completed in June . Codes were MLA-B and ML003A. Although Fishkind names are no longer applied to rolling stock, they are still used for operational purposes. As mentioned, the GB Railfreight MLAs are referred to as Falcons. The EWS wagons have the somewhat more fishy nickname of Red Snappers. 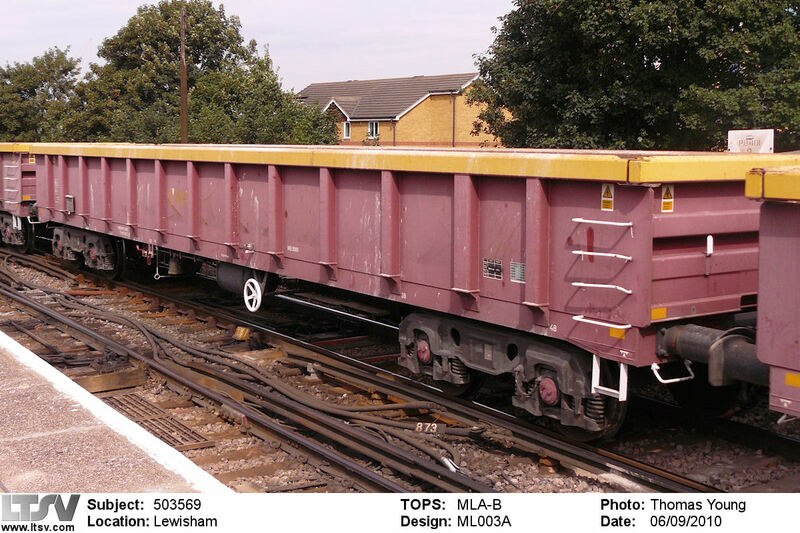 They are used nationally on ballast duties, often intermixed with similar JNA, MLA and IEA wagons. The batch of 105 is split almost equally between two EWS Network pools (6003 and 6005). 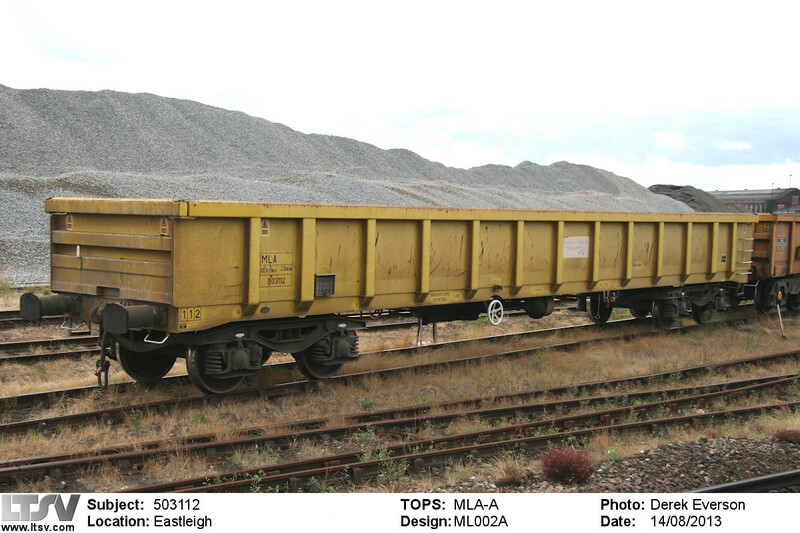 As of late-2013, there have been no changes to TOPS or design codes on any of the MLA wagons . EWS MLA 503569 was seen at Lewisham in September 2010. Despite being less than 3 years old, the EWS red livery has already faded considerably.